With more and more Snapdragon 845-powered smartphones emerged on the market, how has Antutu performance ranking list changed in April? Today Antutu reveals our benchmark results for the global 10 best performance Android phones of April. Is your phone on the list? Come and check with us. 1. Score: the average score of each model, not the highest score (actual running results may fluctuate, which is a normal phenomenon). 2. Period of data statistics: April 1, 2018 to April 30, 2018. 3. Data amount: at least 1000 data samples for a single model. 4. Data source: Antutu Benchmark V7. In April, Samsung Galaxy S9+ (G965U) continued to top the list for the second consecutive month with an average Antutu score of over 260,000, followed by Samsung Galaxy S9+ (G965N) and Galaxy S9 (G960F) respectively, both with an average Antutu score of over 240,000. In particular, Samsung Galaxy S9+ (G965U) is powered by Qualcomm Snapdragon 845 processor, while Samsung Galaxy S9+ (G965N) and Galaxy S9 (G960F) are both powered by Samsung Exynos 9810 processor. 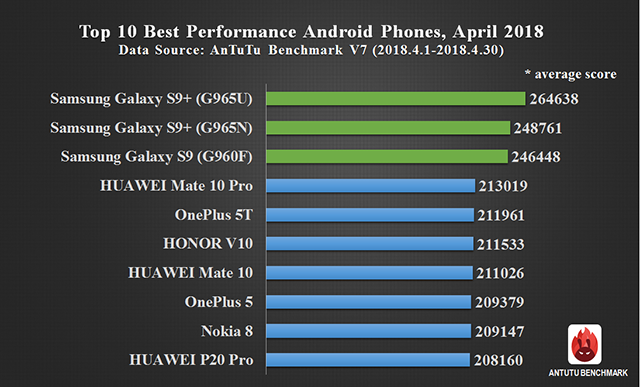 In addition, HUAWEI’s new model HUAWEI P20 Pro made its debut in the list and ranked tenth with an average Antutu score of 208,160. Like HUAWEI Mate 10 Pro, HUAWEI Mate 10 and HONOR V10, HUAWEI P20 Pro is also powered by HUAWEI Kirin 970 processor. Since OnePlus 6 was released in May, it didn’t appear on the list. For more information about the ranking list, please visit Antutu official website or download AnTuTu Benchmark and check in the menu of “Ranking”.